The 2017 U.S. Soccer Girls' Development Academy Winter Showcase Feature games continue Dec. 8 as two NWSL Academy Clubs meet when the Boston Breakers take on the Portland Thorns FC in the U-16/17 age group, while Real Colorado plays Crossfire Premier at the U-18/19 level. A total of 12 teams will have the opportunity to play in Showcase games which are being streamed live on the Development Academy Facebook page, U.S. Soccer YouTube channel and ussoccerda.com. It's a clash we've seen many times in the NWSL, but for the first time, it will take place in the U.S. Soccer Development Academy as the Breakers take on the Thorns at the Stadium Field of Premier Sports Campus in Lakewood Ranch, Fla. The game will make it back-to-back match-ups with the NWSL clubs after the Breakers fell to the Seattle Reign Academy on the first day of the inaugural Girls' Development Academy Showcase by a 3-1 score. Head coach Rolando "Rollo" Lopes has his side trending upwards coming into the Winter Showcase, scoring three or more goals a game in its six wins and 26 total, meaning the Breakers are a side that can find the net. Isabelle Aviza has eight goals, one of 11 players to score this season, while the squad has been led by forwards Mia Otero and Jaydah Bedoya, midfielders Lucy Cappadona and Eleanor Fisher and defender Alyssa Bourgeois. The Breakers are currently in third place and in playoff position in the Northeast Division. Kyle Steinbaugh will lead Portland, bringing a squad into the game that sits in fourth place in the Northwest Division and is coming off a 3-2 loss to the NC Courage Academy in its first game of the Winter Showcase. Key players for the Thorns include midfielder Ava Benedetti, forward Jacqueline Blakeley and forward Paige Alexander, who leads the team with eight tallies. Real Colorado will be without two of its top players as midfielder Jaelin Howell and forward Sophia Smith (who has scored 16 goals in just eight games) are playing with the U.S. U-20 Women's National Team during the Women's Nike International Friendlies, happening concurrently with the Girls' Winter Showcase. 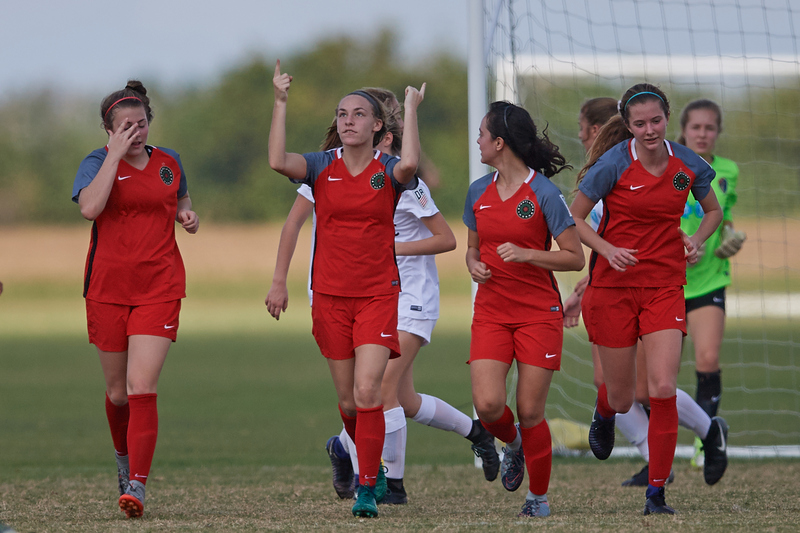 Head coach Jared Spires still brings a strong squad to Florida that came into the Winter Showcase after scoring 35 goals its first 10 games while allowing just seven and compiling an 8-0-2 record, which includes a 1-1 draw with NTH Tophat in its first game of the Winter Showcase. "The slate of games provides us the opportunity to compete with some of the best teams in the country," Spires said. "With both Jaelin and Sophia playing with the U-20s, it's an opportunity for other players to play in key roles." Crossfire also comes into the game with an unbeaten record, after defeating Sky Blue - PDA in its first Winter Showcase game to move to an unblemished 11-0-0. Led by head coach Billy Wiskel, Crossfire scored an amazing 56 goals coming into the Winter Showcase while allowing just two. Catch the feature games streamed live on the Development Academy Facebook page, U.S. Soccer YouTube channel and ussoccerda.com!